The Norse set up their base at Riccall beside the river Ouse and prepare themselves for battle. The invaders have made a bold move and taken their longships along the Humber and up the Ouse. They have chosen a particular time of year with an exceptional tide that will speed them up the river toward York. They have also selected a piece of land beside the Ouse that is connected to the mainland by a number of causeways. This makes it easier to defend if their base is attacked while the army is away doing battle. The tall trees help create a visual division between the panels. Timber would be needed for the camp that the Norsemen were setting up on the island beside the river. The cart is a combination of images from various psalters. The implication of this image is that the local population were willing to trade with the invaders since we see various supplies being brought in to supplement those that the army had brought. The local population would have had little option but to try and trade with these powerful invaders. The central image of this panel shows the ships being unloaded. The Norsemen have arrived not only with warriors and weapons but some supplies. Below the boats an oven is already producing small loaves. Excavations at Riccall confirm that there were women among the party and they are shown in various roles. There are two women baking; one is mixing the dough, the other managing the oven. Two other women feature in the group at the right of this panel. The leader of this party is pointing towards York, while others prepare themselves for the expected battle. A young girl moves among the warriors distributing bread for them to take with them. In the background a warrior is helped into his byrne by his companion, possibly his wife. Many of the figures are developed from the Bayeux. However, the style of shield, weapon and armour is different so many adjustments have been incorporated. The women have been drawn in. The woman distributing bread wears Norwegian costume of the 11th century. The stars and moon show that the activity starts at night. The bird is the national bird of Norway. The centre of the panel has the Nordic goddess Freya watching over the warriors as they prepare themselves for battle. The image of Freya has been designed specially for this panel using various representations of the goddess. The last two images at the top set the scene for later events. The boats are blocking the river Wharfe near the bridge that takes the old Roman road over the river. These are the ships of earl Edwin of Mercia. He has left the ships, and much of his force, to block this route to the invaders. Pervious Viking expeditions had used their longships to reach Mercia. Earl Edwin was not going to allow them to pass unchallenged. He wanted any battle to be fought outside his territory. 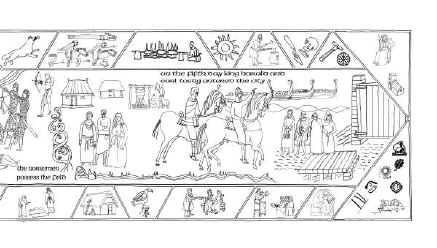 Meanwhile, a rider sets off at sunrise to carry the news to King Harold that the Norse army had arrived in force and was preparing for battle. The narrative shows the rich pasture along the river, providing milk. The figure is another derived from the Luttrell Psalter. The central feature shows earl Morcar rallying the ordinary people of York to prepare for battle. A rider arrives from further afield to join the defence. Both sides are engaged in preparation for battle. These figures are loosely based on 11th century woodcuts from Germany, illustrating the making of great buildings. A boy is arriving with a packhorse. By the age of 12 boys and girls would be hard at work. There would be a great need for supplies to be delivered to the two armies. At the right edge of the panel, a warrior stands guard. This was based on a photograph of a re-enactor. They represent the vigilance of the warriors on both sides who kept watch during the night before the battle.